There’s nothing quite as exciting as writing your first book! I’ve loved writing all of my books, but this first one will always hold a special place in my heart. It was fun, scary, nerve wracking, exhilarating and wild! Every quilt starts with a bundle of twelve fat quarters, hence the name, Bundles of Fun. It’s now in its second printing! 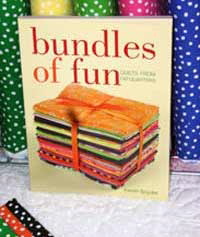 Writing Bundles of Fun was great–and it was well received. I wanted to do another one–and my publisher wanted me to do it, too! This time I didn’t limit myself to 12 fat quarters in each quilt. I used as few as three fat quarters or as many as thirty. Then I had fun with the names, like fun Shui, Summer Fun, Fi Fie Foe Fun, Barrels of Fun……well, you get the idea! Gosh, it makes me want to launch into the Cindy Lauper song, Girls Just Want to Have Fun! 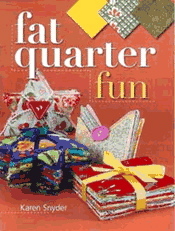 So, then name had to have “Fun” in it, and this book is called “Fat Quarter Fun”!! The next two books happened almost at the same time. I pitched Big Print Quilts to my publisher, and then they asked me if I’d like to write a book tying quilts in with a garden theme. I didn’t want to say no! The idea for this book came from all the gorgeous large scale prints that we’ve been seeing more and more of in recent years. I love them, and I LOVE novelty prints. I knew there had to be a way to show off the beauty of the big floral fabrics and the novelty prints, too. Both of those can be so pretty on the bolt but hard to visualize in a quilt. So, I started playing around with these fabulous fabrics and before you knew it, I had a stack of them and a stack of quilts–and Big Print Quilts was born! Not only does the book show you how to use those large scale floral prints and novelty fabrics, you can also use the patterns for opportunity cloth, embroidered blocks, appliqué blocks, photo transfers and T-shirts–and turn them all into beautiful quilts. 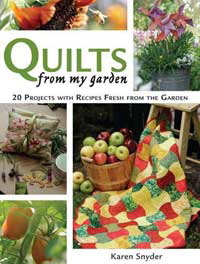 Quilts from My Garden was a departure from my first three books in many ways. 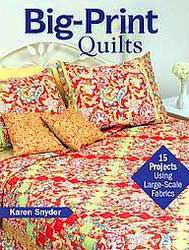 Not only does this book contain quilt patterns, it has projects and recipes. But the thing I’m most proud of is the photography. My other books were photographed in the studio, but this book was photographed in beautiful gardens right here on the Long Beach Peninsula. Many neighbors and friends opened their glorious gardens to me and photographer Sarah Hillman created stunning photos. I don’t know which is prettier, the quilts or the gardens!